Profile: Your agent contact information. Display Preferences: Choose your default display when you sign in to Find. Message Center: A repository for your messages. By default, your profile displays your first and last name. 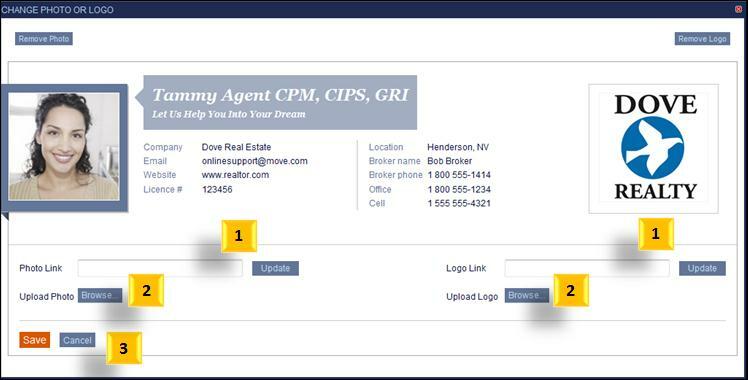 You can add additional information such as your email or phone number, and you can change your basic profile information, including your photo, logo, and branding information. Profile information is used in reports and emails sent out by you and wherever your branding is displayed, unless explicitly excluded. Note: A preview of your branding displays at the bottom of the Profile page. Branding displays on all printed reports, customer emails and customer links to Saved Reports. Tip: All of the following procedures are done on the Profile page. From the main page, click the Settings tab. By default, the Profile sub tab displays. Other available sub-tabs are Display Preferences and Message Center. On the Profile page, make your selections or changes. Click the Update button when all changes are complete. Updates appear immediately on your Profile page and are also reflected in your branding information, when relevant. Note: The first and last name and email fields are mandatory. Click Yes to confirm that you do not want to save the changes. On the Profile page, click the Change Photo or Logo link at the bottom of the page. Add a photo or logo currently visible elsewhere on the Internet by adding either or both Links (URLs) and clicking Update. Click Browse and locate the image file on your computer. Select it and click Open. The field will show the path to the image on your computer. Once your selections are made, click Save to update your changes. On the Profile page, click the Remove Photo or Remove Logo link. Next Lesson: Altering Display Preferences in Find.